Where does Walmart go now? Finally! Good news from a retailer getting ready for the holidays. Walmart reported earnings on Tuesday that topped Wall Street's forecasts. Walmart is bucking a trend. Several prominent retailers have reported lackluster results recently -- including Macy's (M), Gap (GPS) and Nordstrom (JWN). That's led to concerns that retailers may have to use massive discounts to lure shoppers to stores this holiday season, promotions that could crush these companies' already wafer-thin profit margins. Still, it's not as if expectations were all that high for the company. Walmart warned last month that sales would be weak and that wage hikes it announced earlier this year would hurt its profits. The stock is down 33% this year, making it the worst performer in the Dow. Warren Buffett's Berkshire Hathaway (BRKB) disclosed on Monday that it cut its stake in the retailer in the third quarter -- before the earnings warning. 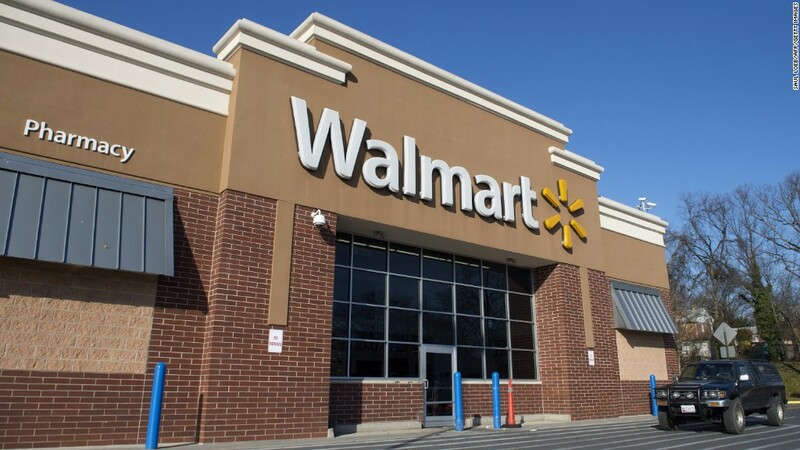 Although overall sales were down more than 1%, Walmart did report its fifth consecutive quarter of same-store sales growth in the U.S. And store traffic rose 1.7%. Total revenue would have been higher if not for currency fluctuations. CEO Doug McMillon said in the company's earnings release that it's "taking the right steps to win with customers." But he conceded that Walmart still has "work to do." During a recorded conference call, McMillon added that Walmart would continue to focus on low prices -- the strategy that has made it the nation's biggest retailer. "We'll continue to win on value. We've won on value in the past and that won't change," he said. But competition from Amazon (AMZN) has also hurt Walmart -- along with other retailers. McMillon and Walmart U.S. CEO Greg Foran both stressed several times during the call that "convenience" was becoming more important for customers. Walmart is investing heavily in its own online retailing operations. Growth, however, has been slow. Foran noted that Walmart has expanded its online grocery pickup service to more stores, a move that will help the company compete more effectively against Kroger (KR) and Costco (COST) as well as Amazon. But e-commerce sales were up only 10% from a year ago. Walmart also cited "pressures in key international markets." McMillon said during the call that Brazil, China and the U.K. were particularly weak. The strong dollar is a problem for Walmart -- which generates about a quarter of its sales overseas. Nonetheless, Wall Street seemed relieved that the company's results were not worse. Neither was its outlook. The company said that it expects fourth quarter earnings to be in a range of $1.40 to $1.55 a share. The current consensus estimate of analysts for the quarter is $1.43 a share. Shares of Walmart (WMT) rose 3.5% Tuesday on the news. Walmart is the first of several big retailers to report its quarterly sales and outlook this week. Target (TGT) and Best Buy (BBY) are on tap to release their results later this week.